When I worked for the US Postal Service in Manhattan. I worked as a specialist on the maintenance of the big Buildings. They ranged in size from the 1.5 million sq/ft Morgan Station on 9th Avenue, which is one of the largest Post Offices in the world, down to the 500,000 sq/ft Grand Central Station one of the largest letter carrier stations in the USA. The common denominator between them all was steam. Con Edison of NY makes steam and sells it as a utility to many large commercial buildings in Manhattan. It usually comes in at around 160 PSI pressure. For much of the equipment like hot water heat exchangers etc, this pressure has to get reduced. The way this gets done is through a pressure reducing valve or PRV station. 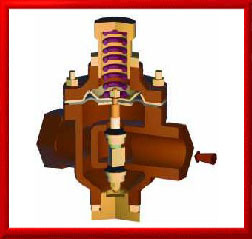 These valves used a sense line on the output side of the valve to sense the back pressure of the steam in the output line and then used this signal to control a diaphragm, which then modulates a steam valve continuously to maintain the pressure in the line. The brands I worked with the most were Leslie, Watts and Spence.